Many of my blogs have been about my children. 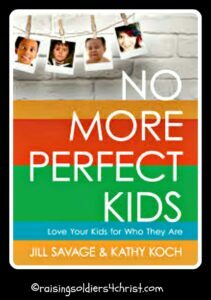 Recently, I was given a copy of No More Perfect Kids to review. Let’s start with what amazon says and then I will give my thoughts. Mom and dad, your kids are created in God’s image, not your own. Jill Savage and Kathy Koch will guide you in truly appreciating your kids. They will teach you how to study and become an expert on your children, because you cannot fully embrace them until you truly know them. Written in a passionate, candid, and personal tone, the authors will instill within you hope and contentment. You’ll be inspired to apply the practical, realistic, and relevant ideas and tactics Jill and Kathy share. Special needs kids will also be addressed in the book. Let’s face it, our kids are not all we envisioned them to be when they were in the womb. Each one has their own personality and, like it or not, those personalities can certainly rub us the wrong way. So as the mom and a fixer in the family, what do we try to do? We try to “fix” their personality to be more what we want it to be. In my own family we have slight special needs issues. I didn’t count on those when my oldest was growing inside my belly. I didn’t count on the fact that my middle son would have hearing issues either. I also didn’t predict that I would spend the first month of my youngest son’s life in and out of doctor’s offices and hospitals because he had a stroke in utero. However, despite the obstacles and despite us knowing that our kids have different personalities and needs, maybe it’s “us” that needs fixing. In the book, the question was asked: “Is it safe to make a mistake in your house?” I had to think and ponder on this. There are times that I am perfectly okay with a mistake and there are other times that I think I forget what it is like to be a kid. However, my perfectionism seeps in and I am not sure! This question made me pause and reflect. Is it okay that I am unique? Children won’t ask for help because they can’t admit they need it. Children will resist trying new things. Children who don’t make mistakes won’t develop resiliency. Children will relate to parents from a perspective of fear. Children may develop a negative and critical perspective toward themselves and others. Children may expect perfectionism from others even though they don’t like trying to meet the expectations themselves. Children will focus primarily on what they cannot do, rather than what they can do. Children expected to be perfect may hesitate to own and believe in their successes because of stress. Children will not believe in or experience the beauty of unconditional love. Being raised with perfection as a goal can negatively influence children’s spiritual growth and how they relate to the God of the Bible. I highly recommend this book to all parents! It has been such an eye opener for me. I give it 5/5 stars! Previous Post: « Modest Monday: Swimsuits and Summer Fun!!! !